follow and believe: Single Women Making a Difference Interview! 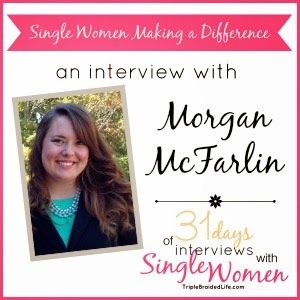 Single Women Making a Difference Interview! A few months back, through our NAS Facebook group, I learned of a blogger who specifically focuses on mentoring young women. Whaaat?! Awesome! I'm always so excited to discover new single-lady bloggers...so discovering Brenda from Triple Braided Life was like discovering a gold mine. Why, you ask? Well, well, well. 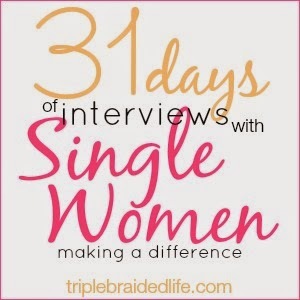 Brenda launched this new series in October called 31 Days of Interviews with Single Women Making a Difference. Basically, every day in October, Brenda interviewed a different single gal who isn't wasting her single years being sad about her relationship status, but is embracing life and living these years to the fullest! It's really been incredible "meeting" all of these other women who are in this same boat! I feel so blessed to be counted among these women and my interview was posted today! Head on over to Brenda's to check it out! Be sure to read the other 30 interviews, as well! WINNER of the CatholicTV Giveaway!